On November 29, 2017 the DIAUD Network held another successful meeting to coordinate efforts for the upcoming 9th session of the World Urban Forum (WUF9). Network members discussed their planned contributions to the forum and presented opportunities for collaboration. The meeting featured presentations by Federico Batista Poitier of GAATES, and Kathy Kline from GAP’s Older Persons PCG, regarding applications submitted for WUF9. Mr. Batista Poitier first outlined the five side events which were submitted on behalf of the Persons with Disabilities Partner Constituent Group, The Global Alliance on Accessible Technologies and Environments (GAATES), and World Enabled. City in the Mirror is an experiential art exhibit, which will include 20 photos that represent the contradictory category of urban development and the unique aspects that are found in cities around the world. The installation also includes an interactive exhibit of the Braille & Audio version of New Urban Agenda in all six official UN languages, professionally animated with sound. This event will work to highlight the need for inclusivity and accessibility in urban development, cultural life, active participation by persons with disabilities. Smart Cities 2030: How to Build Smart Cities for all is a training event which will focus on how Information and Communications Technology (ICT) can be used by cities in innovative ways to promote inclusion and accessibility. The event will present some best practices in Smart City Solutions, and train participants on the Smart Cities for All toolkit and the SC4A Maturity Model for Digital Inclusion. A City for All is a participatory educational activity, which involves participants in an artistic interpretation of the World Urban Forum’s theme “Cities for All.” The project presents a people centered, and age and gender responsive solution towards raising awareness on inclusion, universal accessibility for all persons. The event will be directed by the internationally renowned artist John Quigley, calling to action the need for inclusive and accessible urban development. AXS Mapping for Universal Accessibility will include an interactive presentation by AXS Maps, a crowd-sourced web application which rates and reviews accessibility of public spaces, through a weeklong mapathon of Kuala Lumpur. The event represents an innovative approach towards implementation of the New Urban agenda and actively engages participants to think of urban accessibility and solutions towards inclusion as teams compete to review the most places. Disability Inclusive Disaster Risk Reduction and Climate Change will present solutions which have been implemented to sustainably address challenges to inclusive urban development and resiliency, as well as provide a roadmap for stakeholders to build capacity and progressively prepare resilient, safe, inclusive, and sustainable cities around the world. Ms. Kline next presented the event submitted on behalf of our colleagues from the Older Persons Partner Constituent Group. The New Urban Agenda and Age-Friendly Cities side event works to highlight the references to the role, position and agency of older persons in society in the New Urban Agenda. The event will present the links between the NUA, the Age-Friendly Cities Initiative, and the Agenda 2030 and the Sustainable Development goals as critical elements for consideration in development activities. The symposium will focus on accessibility of shared public spaces to ensure no one is left behind. Finally, two events were submitted on behalf of both the Persons with Disabilities and Older Persons Partner Constituent Group. Implementing Universal Accessibility at the Local Level: Practical Actions for Realizing an Inclusive New Urban Agenda will be a discussion aimed at encouraging effective participation and collaboration among all relevant stakeholders, including local governments, the private sector, civil society, and organizations representing women, youth, older persons, and persons with disabilities. The dialogue will explore how cities and human settlements can facilitate access for persons with disabilities and older persons on an equal basis with others, to the physical environment of cities. The GAP Older Persons and GAP Persons with Disabilities WUF9 Networking Event, will be split into two segments. First, both PCGs will have an opportunity to present requirements for accessible and inclusive urban areas. The presentations will be followed by a networking activity for participants to discuss and present their experiences, challenges, priorities, and objectives working in the field. 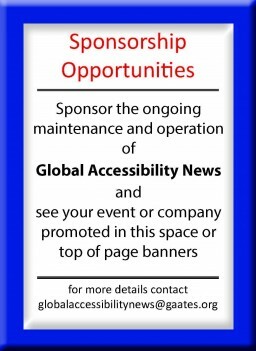 Partners and co-sponsors for the events listed above include: World Enabled, CBM, Global Alliance on Accessible Technologies and Environments (GAATES), the Disability Inclusive and Accessible Urban Development (DIAUD) Network, GAP PWD-PCG, GAP Older Persons PCG, NEXT CITY, UN HABITAT, GIZ, Ford Foundation, AXS Maps, Institute on Disability and Public Policy (IDPP), and G3Ict. All applications are subject to final approval by the World Urban Forum’s organizing committee, and the results will be communicated by December 15th. We will share an update on the agenda for the side events, once we have received approval from the organizing committee. The last day to register to attend the WUF9 is December 15th (Register here).The DIAUD network meeting provided space for members to discuss their possible contributions to these submitted events, encouraging a variety of stakeholders to play a role. The DIAUD Network, and partners, are looking forward to an accessible, inclusive, and eventful World Urban Forum. See you there! The DIAUD Network’s next meeting will take place on Wednesday December 13th, 2017 at 8:00am EDT (2:00 PM CEST | 8:00 PM HKT). The collaboration between the Institute on Disability and Public Policy (IDPP), the Global Alliance on Accessible Technologies and Environments (GAATES), and World Enabled makes the DIAUD Network possible. These network meetings are hosted and recorded on a virtual platform by IDPP and the recordings are available to registered DIAUD Network members. In order to receive updates and further your participation with the Network, join the mailing list, go to https://goo.gl/dtxWJf.